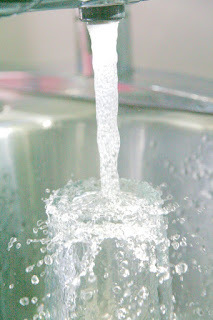 That, folks, is a picture of my beloved water in our kitchen sink. Why is it so special to me? We have been on well water and we have, by far, the, BEST tasting water in the world! No joke!! Just now, however, the workmen came and hooked us up to "city" water. SO SAD! I didn't even know they were going to do it today. I didn't even get one last glass of the gloriously clean and cold well water!! If any of y'all have ever had to switch from well water to city water, you are aware of the difference in taste. I do not look forward to the adjustment. And for any of y'all that have never had well water, no we do NOT go out to a well and pull it up by the bucketful! HA! I miss well water too! My grandparents had the BEST well water...I miss that. I dont like city water either! I use a brita. How come you had to change from well to city? Never heard of that before. Our town has been all well water until recently. We received some kind of state grant to use toward city water. With all the problems that the South has had in the past years of little rain, MANY people around here had to have new wells dug and they eagerly decided that city water was the way to go. Sigh. Not us though. We've been happy with our well water since we moved here and are SO sad to see it go. Oh, I LOVE our well water! It tastes so good and city water is so, well, yucky! Let me correct myself, Leah. I asked Mr. U last night about the water and he said that the county DID choose to have city water and the state DID give a grant to make it possible, but each homeowner can elect to have it run to their home or not. We live in the parsonage (Mr. U is a pastor) and the man in charge of watching over the care of this house decided that we needed city water. So, that's how we came to have this really weird tasting city water. I feel sorry for you. My aunt has well water in north eastern Arkansas and it tastes better than any bottle of water I've ever paid for, even the reverse osmosis kind.